Rhomb.io is a manufacturing system of hardware and software developed by Tecnofingers S.L. devices so companies can get them out to market fast. The rhomb.io hardware system works by increasing the number of concepts developers can trial during the prototyping and testing phases of an electronic device, turning the product development process into a core competency of your business and giving you a competitive advantage. The hardware system, which has complete pin-to-pin compatibility between IC manufacturers, consists of rhomb.io carrier boards and easy to add and remove modules. The ease in which the modules can be attached and removed from the carrier board has reduced any need for complex routing. Rhomb.io motherboards form the foundation of an electronic hardware device. You can choose between pre-designed boards or create your own – either collaboratively with our technical team or privately as all information related to the boards is open source. Every carrier board is created with a number of sockets. This is where the rhomb.io modules can be attached – and where the system gets its name. This PCB class allows you to interconnect rhomb.io to other systems like Arduino, Raspberry and Samsung etc. Rhomb.io modules are what give each electronic device its capabilities. Choose to include a powerful processor or mini controller module. Add more memory, wireless connectivity, or whatever you deem necessary. Rhomb.io gives developers complete creative control over what to include and exclude in the creation of their electronic devices. Modules are attached to the motherboard like Lego. Simply press a module into a free module socket on the motherboard or pry it away to remove it. These modules contain a powerful microprocessor able to run a complete operative system or RTOs. 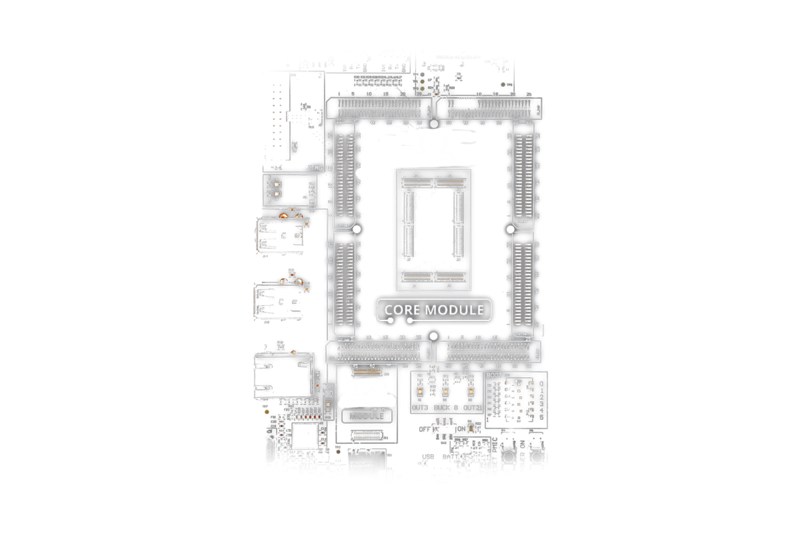 Based on an ARM to x86/x64 microprocessor, rhomb.io core modules will give you everything you need to build a powerful electronic device. This module type is based around a mini controller, from an 8-bit to a more complex and powerful 32-bit like an ARM® Cortex MCUs or even FPGA. Are made up of peripherals like sensors, connectivity modules, memory, GPS, cameras and much more. All of our modules are compatible with all the sockets on each carrier board. We are continually developing new modules, giving you increasing choice and flexibility to create or update electronic devices. For developers who need greater customisation capabilities, all schematics, bill of materials and fabrication files of our carrier boards, Master modules and Slave modules are open source. This way development teams can customise the components going into their electrical devices to meet their needs. All our motherboards and modules can be viewed at our online shop and if you have further questions please contact our technical team here.